PezCycling News - What's Cool In Road Cycling : GIRO’16 St.21: Fairytale Finish for Nizzolo…Then Disaster! GIRO’16 St.21: Fairytale Finish for Nizzolo…Then Disaster! 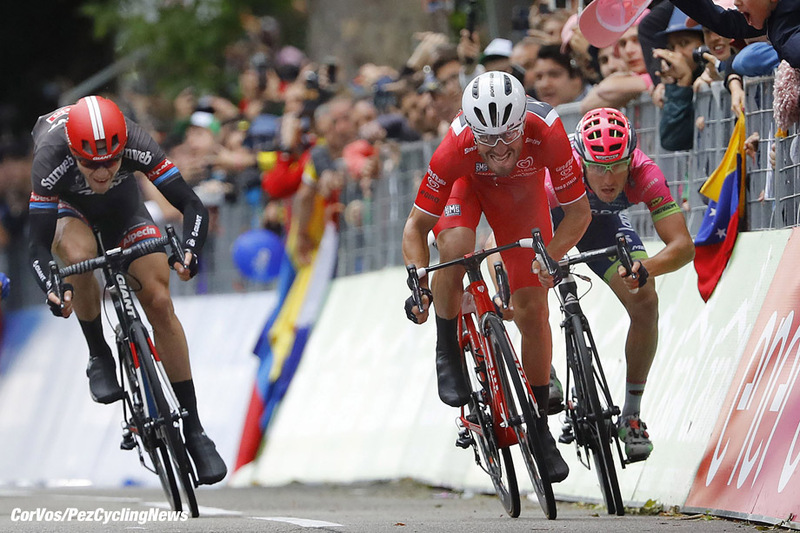 Race Report: It was a damp start to the final stage of the 99th Giro but, despite several crashes, it was a red-hot sprint that saw the man already in Red finally get the win to go with the jersey. Nizzolo (although Modolo wasn’t happy with his line) finished the fastest of the fast men to end this epic race. And then, after the celebrations it was announced that he’d been disqualified! Behind, Vincenzo Nibali was almost carried home by his teammates to seal the victory on a Giro that saw him given up for dead only a handful of days ago. It’s been one of the most remarkable comebacks of recent times and let’s just hope that, despite his team having form, it goes into the history books and stays there for all to admire. And so we’d reached the end of the road on another long and arduous Grand Tour, and it was all over bar the shouting. And what a lot of shouting there had been (this is Italy after all) when their favorite son had pulled off the impossible and climbed into the Maglia Rosa on the penultimate day. Barring a break in the traditional neutralizing of hostilities there was only one competition still to wrap up: and Giacomo Nizzolo (Trek-Segafredo) was in the driving seat with 185 points but snapping at his cleats was Diego Ulissi (Lampre-Merida) on 152 and Matteo Trentin (Etixx - Quick-Step) on 141. It’s never over until the fat lady sings but somewhere in the distance we could just pick up the strains of an aria being practiced in preparation for the winner’s ceremony. 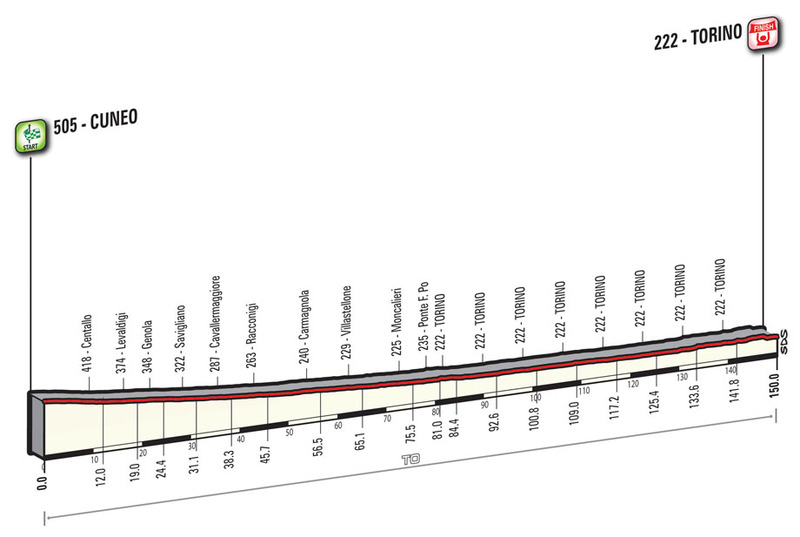 So, all still to play for with sprint points up for grabs at Racconigi and on the finishing circuit in Turin itself. That is if they weren’t neutralized first as the weather had turned again and it was bucketing with rain in Turin and the finishing circuit included two 90˚ turns inside the final km. Of course the poor weather hadn’t put paid to the usual celebrations with Astana lining across the road and Nibali resplendent on a freshly ‘pink-pimped’ bike. The only way you could have got more pink on there would have been if someone had poked him in the eye! The weather was making the road quite slippy and there was a small crash involving BMC and Orica riders and initially it looked minor with everyone up and away quite quickly. But then the distressing news came through to the pressroom that Lars Bak (Lotto Soudal) had hit the ground quite heavily and been forced to abandon with a suspected shoulder blade fracture…a hard pill to swallow for the tall Danish rider. The riders were coming to the first sprint at Racconigi and, true to form, the man in the hot seat hit the front at just the right moment and took maximum points. Ulissi should have been there, but it was his teammate Sacha Modolo (Lampre-Merida) who crossed behind Nizzolo with Trentin in third. Two more to go then but looking good for the Trek-Segafredo man. And then there was action. The LottoNl-Jumbo pairing of Jos Van Emden and Maarten Tjallingii, the latter riding the final grand tour of his career, surged off the front, perhaps in tribute to their young leader and the hold he once had on this race. 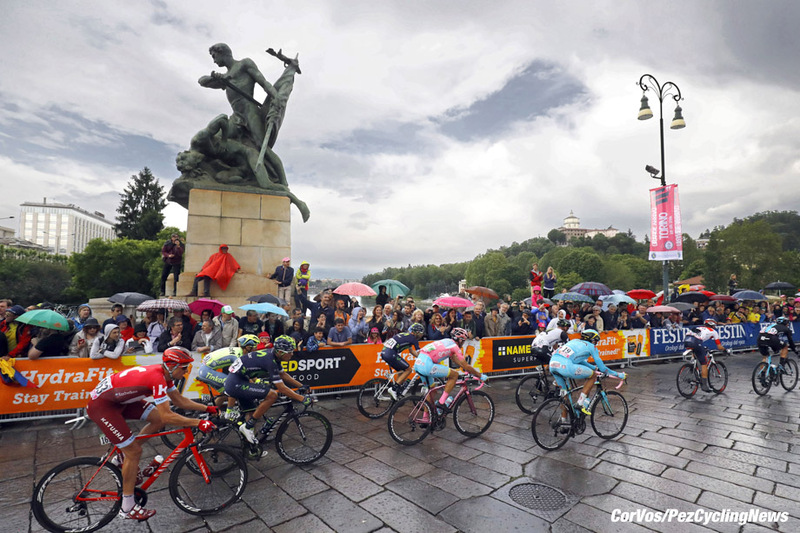 First into Turin and the word was out that due to the conditions the overall positions had been neutralized and all Nibali had to do was cross the line to win this Giro. Others now fancied their chances and a couple of chasers clipped off the front. Gianluca Brambilla (Etixx - Quick-Step) was there as were Manuele Boaro (Tinkoff), Tim Wellens (Lotto Soudal), Simon Clarke (Cannondale) and Eugert Zhupa (Wilier Trestina-Southeast). The Dutch pair had a lead 35 seconds over the chasers with the bunch a further 20 seconds back. With a second intermediate lunge for the line coming up, the sprint trains of Ulissi and Trentin were keen to bring the escapees back and were now riding…but not making too much headway in the slippery conditions. Zhupa and Clarke decided to fall back to the bunch but Brambilla was keen to push on. Keen, but not getting much help. On the large flat flagstones there was a coming together and a number of riders went down on the right-hand side of the road. 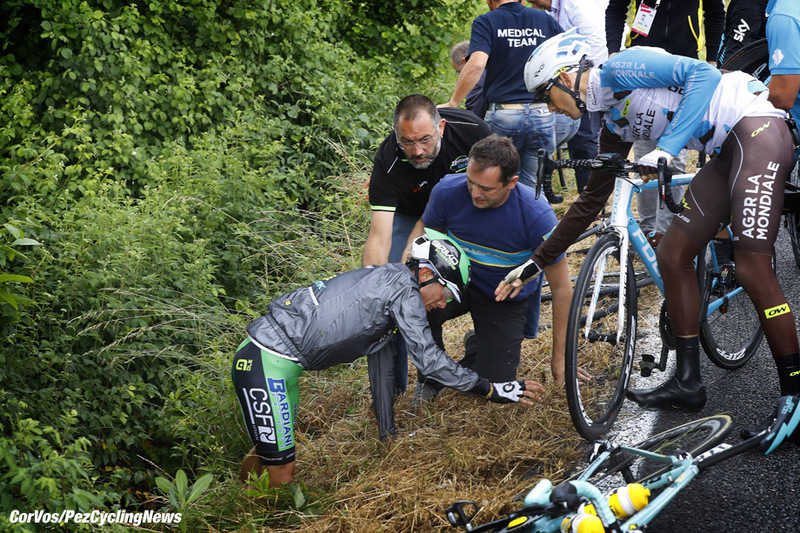 Chaves (Orica-GreenEDGE) had been caught up but he was more concerned about the condition of his countryman Rigoberto Uran (Cannondale) who looked in obvious pain. Eventually most got going again but the Giro organizers had announced that the clock had stopped and Nibali was effectively the winner. Not everyone was up and away as it was announced that Movistar’s Jasha Sutterlin and Johann van Zyl (Dimension Data) had been taken away in the ambulance. Oblivious to all this was the Dutch pair out in front with 18km still to ride and an advantage of 45 seconds. Van Emden was turning himself inside out riding for Tjallingii and there was always a chance that the man from the Friesland province of Holland could cap an excellent career. With just two laps of the 7km circuit to go the sprint teams, Lampre-Merida in particular, really began to throw men into the chase and with Bob Jungels (Etixx - Quick-Step) joining in for his man Trentin, the gap was tumbling. The dream over Tjaliingii sat up but his teammate Van Emden ploughed on with just a slim advantage of 12 seconds with 10km to run to the line. Up the little climb and Van Emden died a thousand deaths as the Jungels-led bunch washed him away. The counter-attack came from Sonny Colbrelli (Bardiani-CSF) on the left-hand side of the road only to see him clip the foot of a spectator and go down in spectacular fashion (he would roll across the line in 94th place, disappointed but not too badly hurt). Another attack with JJ Rojas (Movistar) trying his luck but the bunch was not for letting this stage go to an opportunist. But that’s almost exactly what happened! Suddenly Sean de Bie (Lotto Soudal) was off the front as the race switched through the final turns. A rider from Nippo-Vini Fantini was chasing him down and eventually caught him and headed to the line, which couldn’t come quickly enough. It was just too far and he was overhauled and then suddenly the Red Jersey popped out on the left-hand side of the road and finally the Sprint King had his grand tour stage victory to go with the jersey…or so it seemed! There was a protest from Trentin and Etixx - Quick-Step and after reviewing the footage, and Nizzolo had been celebrating, it was announced that the Trek-Segafredo rider had been unclassified! Coming home a short time later, arms held aloft by his teammates, was the new King of Italy as Vincenzo Nibali took the 99th Giro d’Italia. 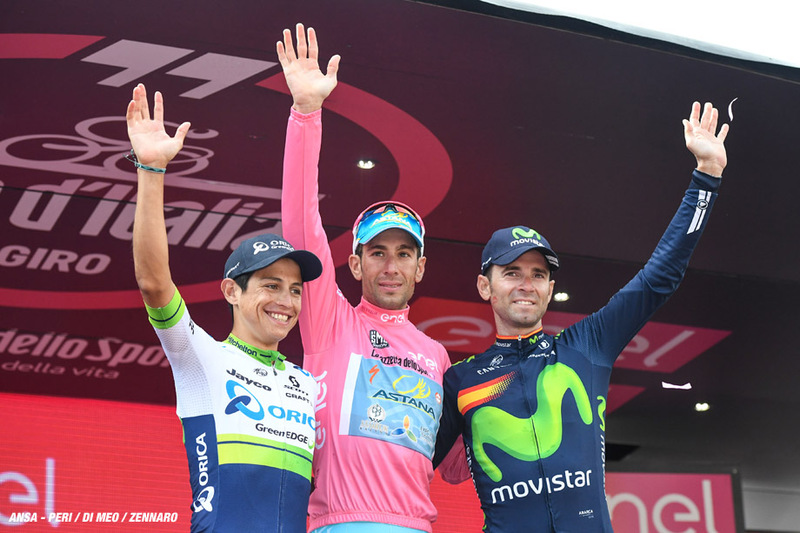 A fantastic win for a rider who showed world-class style in the way he’s raced this Giro. Dead and buried a week ago, he rose from the grave to fight and fight again and finally the fat lady, who had been warming up, could let rip! Keep tuned to PEZ for Ed Hood's day on the Giro d'Italia and catch up with ALL PEZ Giro news here. 25. Roberto Ferrari (Ita) Lampre-Merida. 25. Mikel Nieve (Spa) Sky at 1:05:22.